With lifting capacity up to 110,000 lbs., Kalmar forklifts are designed and built for the world's toughest applications. These highly engineered heavy-duty forklifts offer a high level of reliability, a long life span and can be outfitted with a vast array of forks and attachments that can be integrated with the truck's other functions. Developed primarily for use at high volume ports and steel facilities, these units excel in extremely demanding environments with long shifts, heavy loads and high demands on accessibility. Their success is primarily attributed to machines' high quality, but Kalmar's continually developing service solutions are equally important. 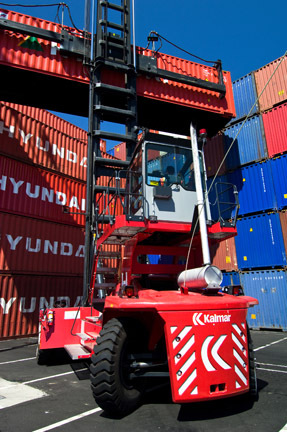 Kalmar also offers equipment and attachments that are uniquely designed for the Wind Industry. Contact your local ITS representative to discuss purchasing a new or used Kalmar truck.